Over the past five seasons on Game of Thrones, it’s been made abundantly clear that navigating the realm of Westeros is no easy task with its unforgiving array of treacherous terrain filled with warring kingdoms, bands of belligerent highwaymen and terrifying tribesman. However, in a move that the show’s ancient Andals of days gone by might have appreciated during their migration across The Narrow Sea, one Reddit user has implemented an imaginary route-advising Google Maps makeover to the colossal continent’s topographical table. Ranging from the dearth of denizens in The Land of Always Winter to the hot-tempered Desert drama of Dorne, this road-ready Westeros map (created by selvag) was thrown together to be sold as a physical display poster available on Etsy. It’s a magnificently illustrated piece that almost makes you feel like you’re out and about coming south from The Twins, looking on your anachronistic cell phone with its inexplicable full bar service status, attempting to discern the best way to reach King’s Landing while completely avoiding the dreaded visage of Harrenhal. Suddenly, Google Maps plots out an advantageous route, avoiding known hangouts of roving robbers and malevolent mummers, before wishing you seven blessings. Of course, the map in question is just a piece of art and doesn’t do anything like that…yet. Still, they seem to be selling extremely well, and Redditors are already asking about the possibility of similar Google Maps rendered version of the Essos continent where characters Arya Stark, Tyron Lannister and Daenerys Targaryen are currently scattered. It’s an audacious amalgamation of two decidedly disparate concepts that works on several levels, though none of them would prove all that helpful in any hypothetical attempts to circumnavigate Westeros’ wonton wave of peril. Indeed, it would be difficult to imagine that The Night’s Watch would, in good conscience, allow Google’s street view cars to make their way north of The Wall to document the depiction of anything even as far as The Fist of the First Men. Looks like those would-be dragonglass pickers looking for material to make that anti-White-Walker mini-gun/samurai sword are out of luck. Additionally, like all Game of Thrones poster maps, it depicts Westeros as a continent shaped by its enormous length, where travel plans are pretty much solely dependent upon the far-reaching route of The Kingsroad. 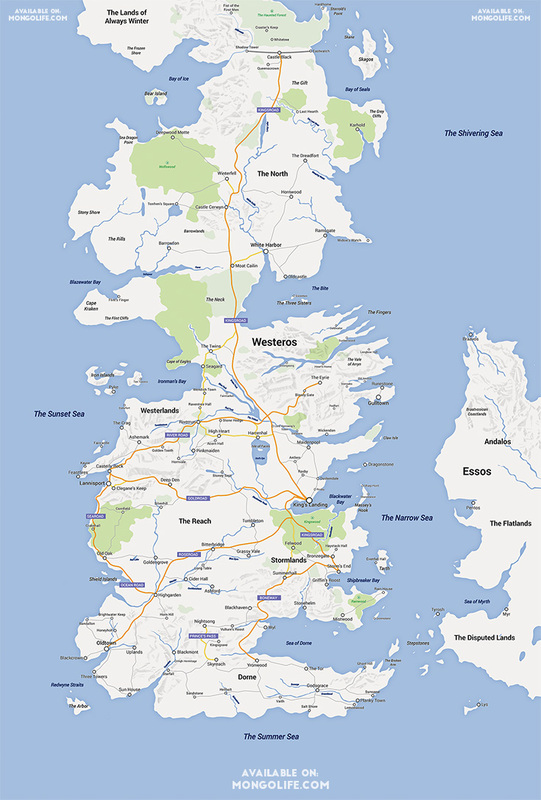 Thus, the task of actually navigating Westeros would likely come down to the simple factor of knowing where north is. However, it does seem that some efforts were taken to plot presumed deviations from The Kingsroad to major points on the map. Of course, directionality would be the least of your problems on any kind of journey in George R.R. Martin’s brutal, savage world, where likability begets an abruptly ending mortality.